Medically, cannabis can do so much for both the body and the mind. Its benefits truly run the gamut: it can help quell anxiety, relieve pain, and decrease epileptic symptoms, to name only a few possible cannabis perks. If you’ve ever wondered just how this plant can help fight so many ailments and assist in numerous situations, your questioning is justified—sometimes it all seems like a random, too-good-to-be-true list of miracles, after all. The reason why cannabis can seem like a magical cure-all has to do with the endocannabinoid system. This system is present in all mammals—it’s why our pets experience the same sorts of benefits from cannabis as we do. Here’s how the ECS works, and why it plays a major part in the way we process cannabis. 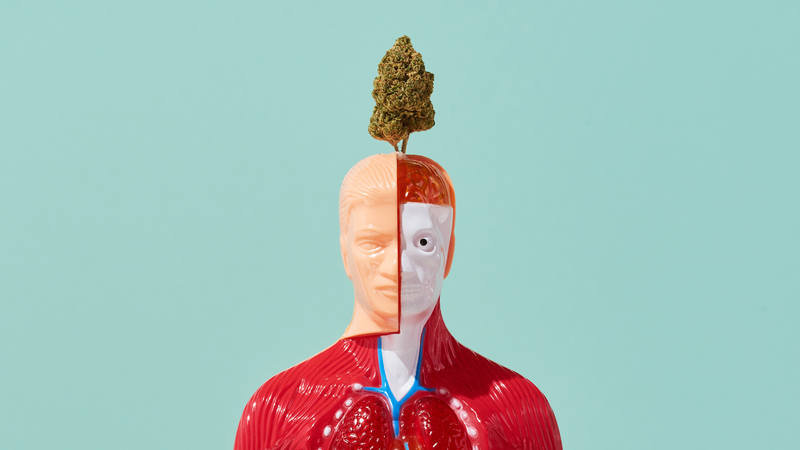 You’re probably familiar with the different organ systems of the human body—the skeletal, muscular, and circulatory systems, to name a few—but you might be less aware of the endocannabinoid system, also known as the ECS. Its main function is to ensure homeostasis in the human body, meaning it exists primarily to maintain balance. It was discovered in 1992 when researchers discovered that the body creates its own cannabinoid, called anandamide, which is the Sanskrit word for bliss. The ECS is made up of three different components: endocannabinoids,cannabinoid receptors, and enzymes. Cannabinoids are chemical compounds that play a major part in ensuring that the body’s central nervous system functions correctly. There are three different kinds: endocannabinoids, which are created naturally by our bodies; phytocannabinoids, which mimic the ones in our bodies and are also found in cannabis plants; and synthetic cannabinoids, which are lab-created. Endocannabinoids are comprised of the aforementioned “Bliss Molecule,” anandamide, and 2-arachidonoylglycerol (the latter of which, sadly, does not have nearly as catchy a name). These two bond with the receptors in the ECS, signaling to the cells just what they need to do. Once the messages are sent between the endocannabinoids and the receptors, enzymes enter the picture and break these messages down before things get too crazy. It’s truly a masterful system of balancing. When we use cannabis, we’re inviting phytocannabinoids into our body, which mimic our natural endocannabinoids to help preserve homeostasis. If for some reason your body is out of whack and cannot bring itself to balance, this is where cannabis proves itself beneficial. Let’s say you’re in pain: cannabinoids will help modulate that pain; if you need help stimulating appetite, cannabinoids can make you hungry. Even beyond the ECS, cannabis effects multiple physiological processes and does what it is needed to get things on the right track. You can learn some more great facts about cannabis and your body just by reading our article on cannabis and pain.